The goal of this research was to evaluate and estimate the effectiveness of center two-way left-turn lanes (TWLT) on two-lane roads as one of the strategies in the Evaluation of Low-Cost Safety Improvements Pooled Fund Study (ELCSI-PFS), Phase I. This research provides Crash Reduction Factor (CRF) and economic analysis for the effectiveness of center TWLT on two-lane roads strategy. The estimate of effectiveness for the center TWLT on two-lane roads strategy was determined by conducting scientifically rigorous before-after evaluations at sites where this strategy was implemented in the United States. The Federal Highway Administration organized a Pooled Fund Study of 26 States to evaluate low-cost safety strategies as part of its strategic highway safety effort. One of the strategies chosen to be evaluated for this study was the installation of center two-way left-turn lanes on two-lane roads. This strategy is intended to reduce the frequency of crashes involving a turning vehicle, which could be classified as head on or rear end. (9.7 km (6.0 mi)) in Illinois, 31 sites (10.95 km (6.8 mi)) in California, and 25 sites (21.25 km (13.2 mi)) in Arkansas. Empirical Bayes methods were incorporated in a before-after analysis to determine the safety effectiveness of installing the two-way left-turn lanes. There was a statistically significant reduction in total and rear-end crashes in each of four States whose installations were evaluated. Rural installations were found to be more effective in reducing crashes than urban ones in each of the four States. Lower cost installations of TWLTLs can be a cost-effective treatment for two-lane rural locations, especially those with a high frequency of rear-end collisions involving a lead vehicle desiring to make a turn. 17. Key Words: Highway safety, two way left turn lanes, two lane highways, highway design, accidents, rear end collisions, head on collisions, countermeasures, before and after studies, evaluation and assessment, Bayes' theorem, empirical methods, regression analysis, statistical analysis, traffic volume, costs, economic analysis. The Federal Highway Administration (FHWA) organized a Pooled Fund Study of 26 States to evaluate low-cost safety strategies as part of its strategic highway safety effort. The purpose of the FHWA Low-Cost Safety Improvements Pooled Fund Study is to evaluate the safety effectiveness of several of the low-cost strategies through scientifically rigorous crash-based studies. One of the strategies chosen to be evaluated for this study was the installation of center two-way left-turn lanes (TWLTLs) on two-lane roads. This strategy is intended to reduce the frequency of head-on and rear-end crashes involving a turning vehicle. The safety effectiveness of this strategy had not previously been thoroughly documented; therefore, this study is an attempt to provide an evaluation through scientifically rigorous procedures. Geometric, traffic, and crash data were obtained for 78 sites (34.9 km (21.3 mi)) in North Carolina, 10 sites (9.7 km (6.0 mi)) in Illinois, 31 sites (10.95 km (6.8 mi)) in California and 25 sites (21.25 km (13.2 mi)) in Arkansas . The average site length was 0.53 km (0.33 mi). Empirical Bayes (EB) methods were incorporated in a before-after analysis to determine the safety effectiveness of installing TWLTLs. The results of the aggregate analysis indicate statistically significant reductions at the 95-percent confidence level in total, injury, and rear-end crashes for the four States combined where installations were evaluated. The positive effects for rear-end crashes comprise the largest crash type reduction. There were too few head-on crashes for a definitive analysis. In a disaggregate analysis, rural installations were found to be more effective in reducing crashes than urban ones in each of the four States. While TWLTLs can be installed when a road is built, they can also be built by converting existing two-lane sections of roadway into three-lane sections through either restriping or reconstruction. The latter option may be relatively expensive if additional right-of-way is required. An example of a TWLTL in North Carolina is provided in figure 1. Figure 1. Example of TWLTL in North Carolina. In 1997, the American Association of State Highway and Transportation Officials (AASHTO) Standing Committee for Highway Traffic Safety, with the assistance of the FHWA, the National Highway Traffic Safety Administration (NHTSA), and the Transportation Research Board (TRB) Committee on Transportation Safety Management, met with safety experts in the field of driver, vehicle, and highway issues from various organizations to develop a strategic plan for highway safety. These participants developed 22 key areas that affect highway safety. The National Cooperative Highway Research Program (NCHRP) published a series of implementation guides to advance the execution of countermeasures targeted to reduce crashes and injuries. Each guide addresses 1 of the 22 emphasis areas and includes an introduction to the problem, a list of objectives for improving safety in that emphasis area, and strategies for each objective. Each strategy is designated as proven, tried, or experimental. Many of the strategies discussed in these guides have not been rigorously evaluated; about 80 percent of the strategies are considered tried or experimental. The FHWA organized a Pooled Fund Study of 26 States to evaluate low-cost safety strategies as part of this strategic highway safety effort. The purpose of the Pooled Fund Study is to evaluate the safety effectiveness of several tried and experimental low-cost safety strategies through scientifically rigorous crash-based or simulation-based studies. Based on inputs from the Pooled Fund Study Technical Advisory Committee and the availability of data, installing center TWLTLs on two-lane roads was selected as a strategy that should be evaluated as part of this effort. According to NCHRP Report 500 Volume 4: A Guide for Addressing Head-on Collisions,(3) literature does provide indications of the effectiveness of TWLTLs but finds that more research specific to two-lane rural roads is needed. For example, NCHRP Report 282(5) used data from California and Michigan to establish nonintersection crash rate estimates (crashes per million vehicle miles) for various multilane design alternatives for suburban highways as shown in the table 1. Table 1. Crash Rates for Two-Lane Undivided and Three-Lane TWLTL California and Michigan Roads. PLT/AP = left-turn crashes susceptible to correction by the TWLTL as a proportion of access-point-related crashes. This is estimated as 0.5. In the above equation, APD is the number of access points per mile (Hauer's equation was based on access points per km), and there is an implicit assumption of an AMF of 0.7 for target crashes. The procedure is applicable for segments with 5 or more driveways per mile. Hovey and Chowdhury(8) used an EB before-after study to evaluate conversions in Ohio to TWLTL from a mixture of two- and four-lane cross-sections. However, there were only three strategy sites, so it not surprising that the reductions of 8.27 percent for total crashes and 19.94 percent in injury crashes were highly insignificant (P-values were 0.30 and 0.22, respectively). As the NCHRP guide concludes, this strategy cannot be considered a proven strategy because there were no truly valid estimates of the effectiveness of such conversions based on sound before-after studies for two-lane roads. The one limited Ohio study, completed after the NCHRP guide was published, is credible but is based on a limited dataset. More studies are needed to substantiate these and other evaluations for the strategy to be confidently and efficiently implemented for maximum cost effectiveness. Total crashes at intersections adjacent to treated segment. Combined Nonintersection and Intersection Crashes. Head-on (including left-turning) injury crashes. If separate safety effects were detectable for various crash types, it may be possible to estimate an overall effect by considering the economic costs by crash type and crash severity using crash costs recently developed by FHWA. What is the overall effect, measured by the economic costs of crashes and by crash type and severity? The study design involved a sample size analysis and the prescription of needed data elements. The sample size analysis assessed the size of sample required to statistically detect an expected change in safety. Estimating sample sizes maintains assumptions on the expected safety effects, average crash frequency at potential strategy sites in the before period, and average number of after period years of available data. Following a literature review, the application of methodology in Hauer(9) (Chap. 9, pp. 127–132), and an accompanying spreadsheet at www.roadsafetyresearch.com, a minimum sample size was estimated. For this analysis, it was assumed that, at the time the study was designed, a conventional before-after study with comparison group design would be used because available sample size estimation methods were based on this assumption. To facilitate the analysis, it was also assumed that the number of comparison sites was equal to the number of strategy sites. The sample size estimations would be conservative because the state-of-the-art EB before-after methodology proposed for the evaluations would require fewer sites than a conventional before-after study. These sample sizes could be reduced if the assumption for crashes per mile-year before strategy implementation turned out to be conservatively low for strategy data or if there were more after period years of data available than assumed. Sample sizes were estimated for various assumptions of likely safety effect and crash frequencies before the strategy was installed. Table 2 provides the crash frequency assumptions used. Two rates were used, both based on SafetyAnalyst development data. Rate A used North Carolina SafetyAnalyst development data and Rate B used Minnesota SafetyAnalyst Development Data. (10) The difference in the two rates is likely due to AADT differences. The range of possible values for the expected safety effects was surmised from the literature review. (9 mi) of roadway and has been in place for 3 years on all 14.5 km (9 mi), this is 43.5 km-years (27 mile-years). Table 3. Minimum Required Before Period Mile-Years for Treated Sites. Note: Bold denotes the minimum sample size and desired sample size calculated per period. A minimum sample size of 732.55 km-years (455 mile-years) and a desirable sample size of 1,181.74 km-years (734 mile-years) per period were calculated as shown in bold in table 3. It was expected that these sample sizes could be reduced if the assumption for crashes per mile-year before strategy implementation was conservatively low for strategy data or if more after period years than assumed was available. The desirable sample assumes that the reduction in crashes could be as low as a 10-percent reduction in all crashes and that this was the smallest benefit that one would be interested in detecting with 90-percent confidence. The logic behind this approach is that safety managers may not wish to implement a measure that reduces crashes by less than 10 percent and that the required sample size to detect a reduction smaller than 10 percent would likely be prohibitively large. The minimum sample indicates the level for which a study seems worthwhile (i.e., it is feasible to detect with 90-percent confidence the largest effect that may reasonably be expected based on what is known currently about the strategy). In this case, a 40-percent reduction in head-on crashes was assumed as the upper limit on safety effectiveness. A factor is then applied to to account for the length of the after period and differences in traffic volumes between the before and after periods. This factor is the sum of the annual SPF predictions for the after period divided by P, the sum of these predictions for the before period. The result, after applying this factor, is an estimate of . The procedure also produces an estimate of the variance of . The estimate of is then summed over all sites in a strategy group of interest (to obtain sum) and compared with the count of crashes during the after period in that group ( sum). The variance of v is also summed over all sites in the strategy group. The percent change in crashes is calculated as 100(1 - ); thus, a value of = 0.7 with a standard deviation of 0.12 indicates a 30-percent reduction in crashes with a standard deviation of 12 percent. TWLTLs for two-lane roads in Arkansas, California, Illinois, and North Carolina were chosen for evaluation based on the availability of installation data, including location and date. Roadway geometry, traffic volumes, and crash data for both the installation and the reference sites were also collected in order to conduct the evaluation. This section provides a summary of the data assembled for the analysis. The Arkansas Highway Transportation Department (AHTD) installed TWLTLs in order to reduce congestion and reduce crashes, particularly rear-end crashes. Two methods were used to install the TWLTLs used in the evaluation: repaving and reconstruction. Repaving reduced the shoulders and narrowed the travel lanes to 3.36 m (11 ft). A 3.05-m (10-ft) center lane was then installed. Reconstruction widened the roadway in order to install an additional 3.36-m (11-ft) or 3.55-m (12-ft) turn lane. It is important to note that the turn lane that resulted from repaving was generally narrower than the turn lane that resulted from reconstruction. The majority of the TWLTLs in Arkansas were installed as reconstruction projects. Installations of TWLTLs were identified through a search of the paper maintenance records that are located at the AHTD. The maintenance records did not contain installation dates. District engineers were contacted in order to verify the existence of the TWLTLs. The installation dates were obtained from the district engineers for those sites that were confirmed to be TWLTLs for two-lane roads. In addition to searching the maintenance records, the roadway inventory was used to identify potential TWLTLs on two-lane roads. AHTD provided a database of State, U.S., and interstate roadway information called Roadlog. Roadlog contains a variable for extra lanes that provides data on lanes other than through traffic lanes. These extra lanes are coded as either none/not applicable, turn lanes/bays, parking lanes, climbing/passing lanes, combination of lanes, or other lanes. According to representatives from the AHTD Planning Department, turn lanes/bays could include TWLTLs. Roadway segments with extra lanes on two-lanes roadways coded as turn lanes/bays were identified as potential TWLTLs. Each district engineer was sent a list of potential TWLTLs and asked to confirm and provide installation dates for each. Additionally, they were asked to list other TWLTLs not included on the list. Several TWLTLs were identified using this method. Intersections adjacent to the TWLTLs were also identified. A list of potential reference sites was generated using Roadlog. Routes that were two-lane and had similar traffic volumes and urban/rural designations as the treatments were included in the evaluation as reference sites. Roadlog was used to obtain roadway information including number of lanes, lane width, shoulder presence, AADT, area type (urban/rural), and other roadway descriptors. Roadlog allows the user to designate a specific district, county, route, and section for querying. Each link outputted by Roadlog is defined by its starting and ending mileposts which typically correspond to a named major cross street or a geographic feature such as a county line or city-limit line. The project team captured roadway information for each link by querying the major cross street and the milepost. Information for intersections adjacent to the TWLTL segments was also obtained from Roadlog. The information collected included number of lanes and AADT. All 2004 AADT data were obtained directly from the Roadlog database query system. Data from 2005 and the years prior to 2004 were obtained from the AHTD Web site. Volumes greater than 1,000 were rounded to the nearest 100; volumes under 1,000 were rounded to the nearest 10. Crash data from 1994 to 2004 for the entire State were provided by the Traffic Safety Section of the AHTD Planning and Research Division. There were several formatting changes throughout the 10-year period. AHTD provided the codebooks necessary to adjust and merge the data. Using the section, route, and log mile variables, crashes on the treatment and reference segments were identified and used in the analysis. The California Department of Transportation (Caltrans) has installed numerous TWLTLs in recent years. Each district office in California was surveyed to collect installation information. Based on responses from the districts, the majority of the TWLTLs evaluated were installed due to high frequency of rear-end crashes involving vehicles that were slowing or stopping in order to turn left. In addition to surveying the districts for installations, each district was sent a list of possible TWLTLs and asked to confirm. These roadway segments were identified using the Highway Safety Information System (HSIS) database. HSIS contains crash, roadway inventory, and traffic volume data for multiple States including California. (11) The districts provided the locations and installation dates of the TWLTLs that could be confirmed, as well as additional TWLTLs in their districts. The districts also included information on additional improvements at the sites in recent years. In addition, intersections adjacent to the TWLTLs were identified. The majority of the TWLTLs in California were installed as reconstruction projects. HSIS was queried to identify suitable reference site locations in California. The reference group totaled 966 km (600 mi). The reference sites were segments greater or equal to 0.16 km (0.1 mi) in length on two-lane, undivided roadways in the same districts as the treated locations (districts 2, 3, 5, 6, and 8). The design speed of the segments had to be 105 km/h (65 mi/h) or less with AADTs between 8,500 and 22,500. All roadway data were obtained from HSIS from 1991 to 2004. Information for the California roadway system is divided into three HSIS files: basic roadway information, data on the characteristics of 20,000 intersections, characteristics of 14,000 interchange ramps. The information for the installation and reference segments were obtained from the roadway file, including design speed, lane width, shoulder width, rural/urban environment, surface width, and terrain for both the TWLTL segments and the reference sites. Data for intersections that were adjacent to the TWLTL segments were obtained from the intersection file. The information collected included number of lanes on major and minor roads, number of legs, left-turn lanes on each roadway, right-turn lanes on each roadway, and the AADT on major and minor roads. Traffic data were obtained from HSIS from 1991 to 2004. AADT for the roadway segments were collected from the roadway file, and AADT for the adjacent intersections were collected from the intersection file. Crash data were obtained from HSIS from 1991 to 2004. The variables collected from the crash file included crash date, crash type, hour of occurrence, within/not within intersection, light condition, road surface condition, crash severity, and weather condition. The Illinois Department of Transportation (IDOT) installs TWLTLs as part of its safety improvement process on State roads. The IDOT districts were surveyed in order to obtain installation information. Each IDOT district reported several locations where TWLTLs had been installed in recent years as safety improvements. The majority of the TWLTL installations in this study were locations where a two-lane road was widened to three lanes, with the center lane being a TWLTL. The IDOT districts provided data on the location of the installation (county, route, start and end mileposts) and the dates of the beginning and end of construction. Project letting plans for each installation were reviewed to verify the installation information. HSIS data was used to develop a reference group. The reference group included all sections of road in the State that were similar to the treatment sites, except for those roadway segments on which the TWLTLs were installed. The constraints on this selection were that the reference segments should be urban roads with two-lanes, a maximum speed limit of 72.45 km/h (45 mi/h), uncontrolled access, and two-way operation. Roadway data were obtained from two sources, HSIS and IDOT construction letting plans. HSIS provided most of the roadway characteristics information, including shoulder width, lane width, and speed limit. Other variables, such as number of lanes and median type, were requested to confirm the information provided by the districts. The other roadway data came from construction letting plans. A project team member visited the IDOT archive office and obtained copies of letting plans. The archive contains project plans, which include plan/profile views of the project, pavement marking plans, cross-sections, quantities, drainage, and other information. Unsignalized intersection density and driveway density were obtained from these plans. The plans were also used to verify the start and end points of the construction, as start and end points provided by the district were not always accurate. Locations where multiple improvements had occurred, such as the addition of a turning lane at an intersection, were also collected. Traffic volume data were obtained from HSIS. AADT was obtained for each year from 1990 to 2004. Crashes occurring on the treatment and reference sections were obtained from HSIS in an annual format from 1990 to 2004. The HSIS crash data included crash characteristics, such as date, severity, and crash type. The North Carolina Department of Transportation (NCDOT) installs TWLTLs as part of its safety improvement process on State roads. The length of each of the TWLTL sections varies by location. The sections that were fairly short and low cost were installed as part of the NCDOT Spot Safety Program. Data on these installations were provided from the NCDOT Safety Evaluation Group. Longer, more expensive sections were installed as part of the Transportation Improvement Program (TIP). Data on these TIP installations were obtained from NCDOT local offices. The TWLTL installations for this study included locations where a two-lane road was widened to three lanes, with the middle lane being a TWLTL. Most TWLTLs were installed to provide storage room for left-turning motorists and reduce rear-end crashes. Some installations had the additional stated purpose of reducing congestion. NCDOT provided data on the TWLTL installations, including date of installation, description of start and end points, and approximate cost. They also supplied a project file for each installation, which included information such as the reason for the installation, maps of the area, and letters of correspondence concerning the installation. Sections of roadway 8.05 km (5 mi) on either side of each treatment section were used to create the group of reference sites. Two-lane sections of road with the necessary similarity in characteristics to the treatment sites including traffic volume, area type, and driver demographics were included in the reference group. Roadway data were obtained from two sources. Road characteristics, such as shoulder width, number of lanes (for identification of reference sections), and speed limit, were obtained from HSIS. Other characteristics, such as driveway density, were coded from the project files obtained from NCDOT. The presence and location of any signalized intersections on or near the study sites were noted. AADT from 1990 to 2004 were obtained from HSIS. These values reflect the traffic volume data maintained by the NCDOT Traffic Survey Unit. Crash data were obtained from HSIS. In North Carolina, crashes are assigned a location milepost number along the route on which they occur, allowing them to be linked with roadway characteristics for that milepost section. According to the January 2006 North Carolina HSIS Guidebook,(12) 70 percent of the approximate 230,000 crashes that occur in North Carolina each year are linkable. Crashes that are assigned to a road but not mile-posted are given the milepost "9999," indicating an unknown location along the road. HSIS only maintains crash data for mile-posted crashes. The end result for this study is that the total crashes reported for a particular road segment may be lower than the actual number of crashes occurring on that segment. However, because this issue causes the same effect on reference sections, the potential for bias is fairly low. HSIS crash data included characteristics of the crashes, such as date, severity, and crash type. Crash data for the treatment and reference sites were obtained annually from 1990 to 2004. The analysis included a total of 530.2 km-years (329.3 mile-years) of before period data (95.8 km-years (59.5 mile-years) from Arkansas, 90.6 km-years (56.3 mile-years) from California, 38.4 km-years (22.6 mile-years) from Illinois, and 307.3 km-years (190.9 mile-years) from North Carolina) and 407.2 km-years (252.9 mile-years) of after period data (127.8 km-years (79.4 mile-years) from Arkansas, 52 km-years (32.3 mile-years) from California, 20.8 km-years (12.9 mile-years) from Illinois, and 206.6 km-years (128.3 mile-years) from North Carolina). The study design estimated 732.6 km-years (455 mile-years) of data in each period were required to detect a 40-percent reduction in head-on crashes and 1,181.7 km-years (734 mile-years) required to detect a 10-percent reduction in all crashes. However, that was based on a very conservative assumption of 0.27 crashes per mile-year, as shown in table 2, in the before period at typical two-lane rural road segments. In actuality, the treatment sites had, on average, 7.61 crashes per mile-year in the before period. Therefore, the reduced sample size (compared to that prescribed in the study design) was deemed to be more than adequate. Table 4 provides crash definitions used in the four States. This information is crucial in applying the safety effect estimates in other jurisdictions. Table 5 provides summary information for the data collected. This information should not be used to make simple before-after comparisons of crashes per-site year since such an analysis would not account for factors other than the strategy that may cause safety to change between the two periods. Such comparisons are properly done with the EB analysis as presented in subsequent sections. This section presents the SPFs developed for use in the EB methodology. (9) Generalized linear modeling was used to estimate model coefficients using the software package SAS® and assuming a negative binomial error distribution, which is consistent with the state of research in developing these models. AADT is the average daily traffic on roadway. length is the length of road segment in miles. Xi is a vector of independent variables related to the roadway. In specifying a negative binomial error structure, the dispersion parameter, k, which relates the mean and variance of the SPF estimate and is used in equations 4 and 5 of the EB methodology, is iteratively estimated from the model and the data. The value of k is such that the smaller its value, the better a model is for a given set of data. The value of is obtained as the e ln( ), where ln( ) is the model output. The value of the parameter k is used in the EB methodology. The value for "Pr > ChiSq" gives the level at which the estimate is significant. For example, Pr > ChiSq = 0.05 indicates that the parameter estimate is statistically significant at the 5-percent level (or, alternatively, that the 95-percent confidence interval does not include a value of 0). The SPFs are detailed in appendices A through D.
Based on the data, two sets of results were calculated and are presented in the following sections. One set contains aggregate results for each State and for the four combined. The other set is based on a disaggregate analysis that attempted to discern factors that may impact the safety effectiveness of this treatment. The aggregate results are shown in tables 6 through 10 for crash types for which a rigorous analysis was possible. The results that are statistically significant at the 95-percent confidence level are shown in bold. Note that a negative sign indicates an increase in crashes. The results are generally favorable, especially for rear-end crashes for which the crash reductions were all statistically significant at the 95-percent confidence level. Reductions in rear-end crashes ranged from 21.7 to 49.9 percent, with a combined effect over all four States of 38.7 percent. The reductions for all crashes combined range from a statistically insignificant 12.6 percent in Illinois to a highly significant 34.1 percent in California, with a statistically significant aggregate reduction of 20.3 percent over all four States combined. In general, the effects were smaller for North Carolina, the State with the most data, than for the other States. For other crash types not presented in tables 6 through 10, the available data did not facilitate a rigorous aggregate analysis. Preliminary analyses for head-on crashes and for differences between intersection and nonintersection crashes supported the decision not to present results for those crash types. There were very few reported head-on crashes, but a cursory analysis revealed that the treatment might be quite effective. In the after treatment period for all four States combined, there were only 14 crashes classified as head-on; however, the cursory EB analysis estimated that approximately 36 crashes would have occurred in the after period without treatment. A similarly cursory EB analysis was done for the effects on crashes classified as intersection or nonintersection. The SPFs used were crude; it was not possible to include key variables such as intersection frequency and turning volumes. It is likely that the States had different definitions for intersection crashes. Thus, it was not surprising that the results of this cursory analysis were mixed. For example, for Illinois and North Carolina, the percent reduction for intersection crashes was significantly larger than for nonintersection crashes, while the converse was true for California and Arkansas. The wide ranges of effects found in tables 6 through 10 emphasize the need for a disaggregate analysis to determine if significant effects can be detected for specific conditions and if there are conditions that might not be conducive to installing TWLTLs on two-lane roads. This analysis is presented in the next section. Table 6. Results for Arkansas Strategy Sites. Table 7. Results for California Strategy Sites. Table 8. Results for Illinois Strategy Sites. Table 9. Results for North Carolina Strategy Sites. The negative sign indicates an increase in crashes. Table 10. Combined Results for Strategy Sites in Four States. The disaggregate analysis attempted to discern factors that may impact the safety effectiveness of installing TWLTLs on two-lane roads. Other than road environment, the results do not suggest definitive evidence of such factors. The separate results for urban and rural environment installations are reported in table 11. There seems to be a clear trend—for all States rural installations are more effective than for urban ones; the difference is highly significant, except for Illinois. The results that are statistically significant at the 95-percent confidence level are shown in bold. Table 11. Results of the Disaggregate Analysis by Type of Environment. Notes: Negative sign indicates an increase in crashes. Bold denotes results that are statistically significant at the 95% confidence level. The disaggregate analysis examined other factors but could not provide any useful insights. There was sparse information on intersection and driveway density, two factors that would likely impact the effect of this treatment. Information on speed was inconsistent; any possible impact on the effectiveness of speed on this treatment could not be discerned. California data provided design speed, while North Carolina provided speed limit. Even so, in the latter case, many roads classified as urban in the data had speeds of 88.55 km/h (55 mi/h) and several roads classified as rural had speed limits of less than 48.3 km/h (30 mi/h), further confounding attempts to identifythe impacts of speed. The project team also explored disaggregating the data by sites that have been restriped versus sites that were reconstructed in order to install the TWLTL. However, the majority of the sites have been reconstructed. There was not a large enough sample of restriping projects to produce statistically significant results. From the aggregate analysis and from logical considerations, locations with a high frequency of rear-end collisions, especially those involving a lead vehicle desiring to make a turn into a driveway along the two-lane road, would benefit from installing TWLTLs. This finding in itself can provide sound guidance in selecting locations for which this treatment would have the greatest impact. Such locations may be more prevalent on roads classified as rural in one State and as urban in another. Thus, caution should be exercised in applying the finding that the treatments seem more likely to be effective in rural areas than in urban ones. Because of the clear trend for rural installations to be more effective, results for all States were combined by crash type to derive estimated reductions for rural treatments. These are shown in table 12. Table 12. Combined Results for Rural Strategy Sites in Four States. The purpose of the economic analysis is to determine the economic feasibility of applying this strategy. Construction cost was estimated and expressed as an annual cost and then compared to the crash savings calculated from the crash effect estimates and the most recent FHWA unit crash cost data. (13) These data indicated that the mean comprehensive crash cost for a rear-end crash ranged from $13,238 for unsignalized intersections to $30,090 for nonintersection locations. Initial construction cost data provided by the four States had a large range, depending on whether or not the existing cross-section between the shoulder edges could accommodate the extra lane. A mean value was used in the economic analysis. Based on the Office of Management and Budget suggested discount rate of 7 percent, and on a 50-year life, the initial costs per mile were converted to annual costs (using the standard economics formula for a capital recovery factor) and compared to the cost per mile-year for rear-end crashes saved. Maintenance costs were assumed to be negligible compared to construction costs and crash savings, based on information provided by the States. Also omitted (conservatively) are operational benefits and safety benefits for crashes other than rear-end crashes. The cost comparison numbers for each State are presented in table 13. Table 13. Comparison of Construction Costs and Crash Savings. This comparison suggests that this strategy can be cost effective, depending on the installation costs and the amount of operational benefits. It is critical to select locations where the rear-end target crashes and, by extension, the target crash savings, are likely to be highest. The objective of this study was to evaluate the safety effectiveness of installing TWLTLs on rural roads as measured by crash frequency before and after installation. The study also examined the effects of this strategy on specific crash types; total, injury, and rear-end crashes were examined in a rigorous analysis, while a cursory analysis was performed for head-on, intersection, and nonintersection crashes. The results of the aggregate analysis indicate statistically significant reductions at the 95-percent confidence level in total, injury, and rear-end crashes for the four States combined where installations were evaluated. The positive effects for rear-end crashes comprise the largest crash- type reduction. There were too few head-on crashes for a definitive analysis. The disaggregate analysis was intended to provide further insight into the circumstances where crash reductions were identified. For all States, rural installations were found to be more effective than urban ones; the difference was highly significant, except in Illinois. For urban installations, the safety effects were negligible, suggesting that potential sites in this environment should be very carefully selected and that further research may be needed to identify circumstances most favorable for urban installations. There was sparse or inconsistent information on intersection and driveway density—two factors that would likely impact the effect of this treatment and so any possible impact of these factors could not be discerned. 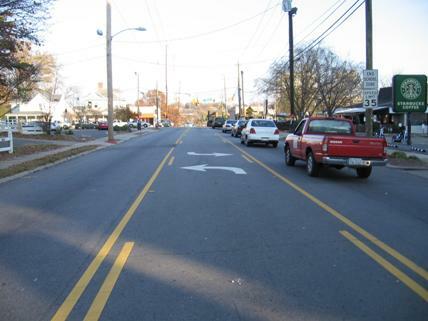 There was also not a large enough sample of restriping projects to differentiate between the effects of the two methods of installation of the turn lanes, restriping versus widening. TWLTLs added to two-lane roadways can be a cost-effective treatment for rural installations, particularly for the lower cost installations. More research is required to ascertain if there are circumstances under which urban installations would also be cost effective. Based on the conservative lower 95-percent confidence limit of the safety effect estimates, reductions of at least 29 percent, 19 percent, and 36 percent can be expected in total, injury, and rear-end crashes, respectively, at rural installations as presented in table 14. However, it may be necessary to use the point estimate (36-percent, 35-percent, and 47-percent reductions for total, injury, and rear-end crashes, respectively) when comparing various potential countermeasures, particularly when confidence limits are not available for all potential strategies. This ensures that all countermeasures are treated equally when making a cost-benefit comparison. From the analysis and logical considerations, locations with a high frequency of rear-end collisions, especially those involving a lead vehicle desiring to make a turn, would experience a greater safety benefit from this treatment and would be prime candidates for installing TWLTLs. Future research on the impacts of intersection and driveway density and on differentiating the effect of the two installation methods, restriping versus widening, could provide additional insights. It is recommended that the accident modification factor (AMF) for TWLTL in the Interactive Highway Safety Design Model be revisited in the light of the findings in this research because AMF, which is for total crashes, makes an implicit assumption about the AMF for target crashes. Table 15. Arkansas Total—All Severities. Table 21. California Total—All Severities. overdispersion parameter for total SPF. Table 27. Illinois Total—All Severities. Apply model for total crashes with a multiplicative factor of 0.615. Table 33. North Carolina Total—All Severities. Table 34. North Carolina Injury. Table 35. North Carolina Nonintersection. Table 36. North Carolina Total Intersection. Table 37. North Carolina Head-On. Table 38. North Carolina Rear-End. This report was prepared by Vanasse Hangen Brustlin, Inc (VHB) for the Federal Highway Administration (FHWA), Office Safety under Contract DTFH61-05-D-00024. The current FHWA COTM for this project is Roya Amjadi. Kerry Perrillo Childress served as FHWA COTM from September 2005 until December 2006. Kimberly Eccles, P.E, of VHB was the study principal investigator. Dr. Bhagwant Persaud and Craig Lyon, subcontractors to VHB, conducted the analysis of the strategy and are the primary authors of the report. Nancy X. Lefler of VHB led the data collection for the study and is a supporting author. Other significant contributions to the study were made by Daniel Carter from the UNC Highway Safety Research Center, Dr. Hugh McGee, Dr. Forrest Council, Bryon White, and Michelle Scism, all of VHB. California Department of Transportation, particularly Thomas Schriber and Janice Benton. The North Carolina Department of Transportation, particularly Shawn Troy and Brian Mayhew. The Illinois Department of Transportation, particularly David Piper. National Center for Statistics and Analysis of the National Highway Traffic Safety Administration (2005). Traffic Safety Facts. National Highway Traffic Safety Administration, Washington, DC. Neuman , T.R., R. Pfefer, K. L. Slack, K. K. Hardy, H. McGee, L. Prothe, K. Eccles, and F. Council. (2003). "Guidance for Implementation of the AASHTO Strategic Highway Safety Plan: A Guide for Addressing Head-On Collisions." NCHRP Report 500, Volume 4, Transportation Research Board, Washington, DC. Federal Highway Administration (2002). "National Agenda for Intersection Safety." Washington, DC. Accessed online: May 14, 2007. (http://safety.fhwa.dot.gov/intersection/resources/intersafagenda/). Harwood, D.W. (1986). Multilane Design Alternatives for Improving Suburban Highways, National Cooperative Highway Research Program Report 282, Transportation Research Board, Washington, D.C.
Hauer, E. (2000). "Highway Medians and Safety: Review of literature for the Interactive Highway Safety Design Model." Accessed online: December 2006. (http://www.roadsafetyresearch.com). Harwood, D.W., Harwood, F.W. Council, F., Hauer, E., Hughes, W.E., and Vogt, A. (2000). Prediction of the Expected Safety Performance of Rural Two-Lane Highways, FHWA-RD-99-207, Federal Highway Administration, McLean, VA.
Hauer, E. (1997). Observational Before-After Studies in Road Safety: Estimating the Effect of Highway and Traffic Engineering Measures on Road Safety, Pergamon Press, Elseviser Science Ltd., Oxford, U.K.
Federal Highway Administration. "SafetyAnalyst" Washington, DC. Accessed online: November 2006. (http://www.safetyanalyst.org/). Highway Safety Information Systems. Federal Highway Administration, Turner-Fairbank Highway Research Center, McLean,VA, Accessed online: December 2006. (http://www.hsisinfo.org/). Council, F., Patel, R., and Mohamedshah, Y. (2006). Highway Safety Information System Guidebook for the North Carolina State Data Files. Federal Highway Administration, Washington, DC. Council, F., Zaloshnja, E., Miller, T., and Persaud, B. (2005) Crash Cost Estimates by Maximum Police-Reported Injury Severity Within Selected Crash Geometries. Federal Highway Administration, McLean, VA.
Keywords: research, safety, highway safety, two way left turn lanes, two lane highways, highway design, accidents, rear end collisions, head on collisions, countermeasures, before and after studies, evaluation and assessment, Bayes' theorem, Empirical methods, regression analysis, statistical analysis, traffic volume, costs, economic analysis.